In prehistoric times, an gigantic asteroid crashed into the Earth – an event that many believed changed the planet’s atmosphere and resulted in the death of the dinosaurs. Actually, the meteor imprisoned an evil, sentient fungus named Ooo-Zah, and after the crash landing freed it from its rocky prison, the creature was able to build itself an animated body of stone that it utilized to single-handedly kill all of the saurians on the planet – purely for malevolent reasons. Until a cheese factory drilled deep into the ground to create gigantic warehouses for their product. Eventually small portions of Ooo-Zah were able to make their way through hairline cracks into the factory, and begin growing on the cheese. Eventually the cheese was processed and shipped to pizza factories… and of course, April brings the pizza containing Ooo-Zah home. When light strikes the alien cheese, Ooo-Zah’s power grows! The monster attacks the Turtles and April and a long battle ensues. 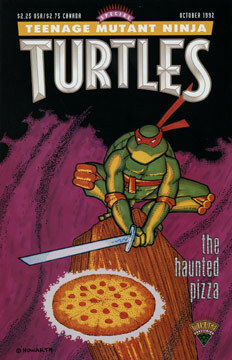 The TMNT’s efforts are for naught, as Ooo-Zah’s chessy body seems invincible… but Donatello finally realizes that light is the source of the beast’s power, and he throws a shuriken into the only lit lamp. The room is plunged into darkness, and the ninjas defeat the monster by cutting it into tiny pieces. The guys pack the bits into a trunk and carry in deep into the sewers to bury it, and Ooo-Zah is entombed once more.